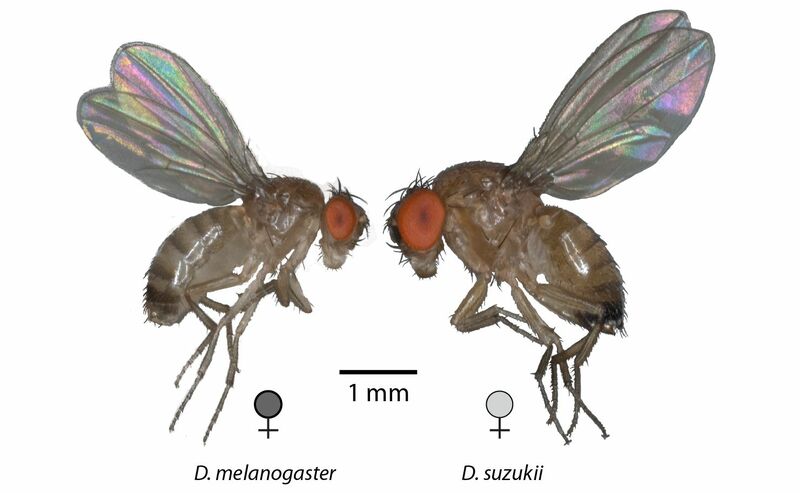 During the last few years in the laboratory, while pursuing various projects related to the pest species Drosophila suzukii, we continually observed large differences in the response of this insect towards visual cues during host navigation, especially in comparison to D. melanogaster, whose behavior is well known to be overwhelmingly odor-driven. While we generally focus solely upon chemical cues, we could not overlook multi-modal integration from additional sensory systems when accounting for the behavioral variation observed between these two species. Intriguingly, upon closer inspection, especially in regard to the size of the compound eye, we were struck by the readily apparent differences between the visual systems. It was also surprising to document, when we corrected for absolute size differences, that the relative size of the antenna was also much smaller for D. suzukii as compared to our model organism; moreover, that the eye and the antenna appeared to be inversely correlated. Given this deviation in sensory structures, we next wanted to examine additional species, which snow-balled from the original two species, first to include eight more species, then thirty species, and eventually to span over sixty total species. With each new cohort of representatives from this genus we sought to reexamine and retest this unexpected inverse relationship between visual and olfactory structures. 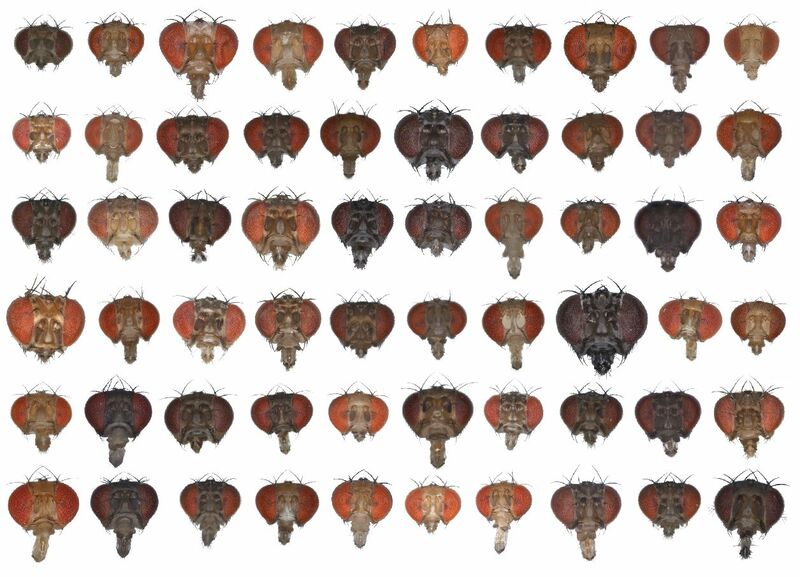 Therefore, what had started as a relatively simple observation and study between a single pair of flies, rapidly grew into a much more encompassing data-set spanning several dozen species throughout this impressively diverse genus of insects. 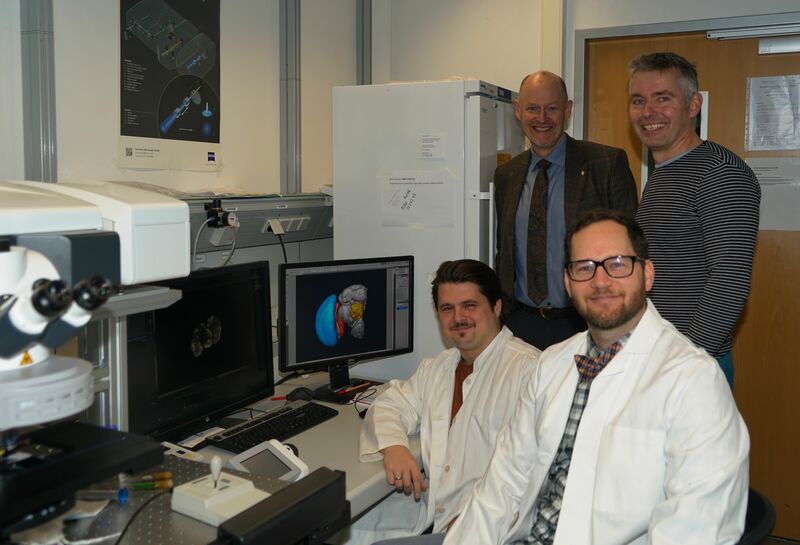 We were also fortunate in that our department covers a wide-range of interests within the field of Evolutionary Neuroethology, including a recent expansion of equipment for high-resolution imaging. 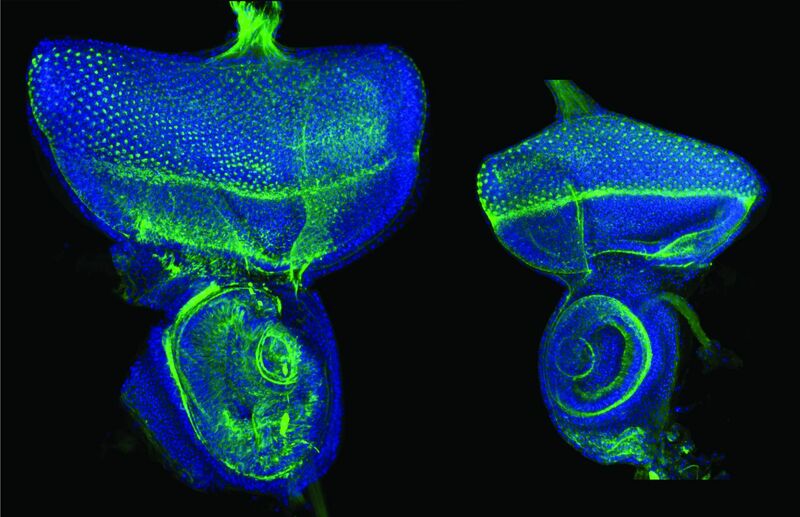 Thus just as this project was starting to expand and examine a wide array of Drosophila species, it was also starting to bring together a broad array of scientists, each of which offering a unique perspective and a novel approach towards the examination of our growing sensory tradeoff hypothesis, including scientific expertise within neuroanatomy, developmental biology, and molecular genetics. (Measurements were made from the developmental structures of each species. Interestingly, a single imaginal disc gives rise to both the eye and antenna, perhaps acting as a constraint or limitation, where one system cannot grow without shrinking the other proportionally due to the sharing of a single finite resource. However, as the dataset expanded, so did the complications with managing statistical assessments. Thankfully the Max Planck Society promotes outstanding partnerships and cooperation between the various Institutions, and serendipitously, during a conference, a connection was made to Dario Riccardo Valenzano, an outstanding evolutionary biologist, who was able to apply a broader understanding of evolutionary genetics as well as the necessary mathematical tools to address our rapidly expanding series of measurements. In the end, while the results presented in our current paper are consistent with a sensory tradeoff, more work is still needed to continue to test our hypotheses, and this marks only the beginning for the examination of the principles that govern the ecological, developmental and evolutionary forces that have shaped the nervous system. As such, we look forward to future studies of multi-modal integration, studies which will provide an expansion of ecological knowledge concerning non-melanogaster species within Drosophilidae, as well as those studies that examine the behavioral relevance of variation in neuroanatomy as seen through the lens of evolution.